The agreement among the Big Three at the Crimean Conference could provide the road map for a lasting peace. 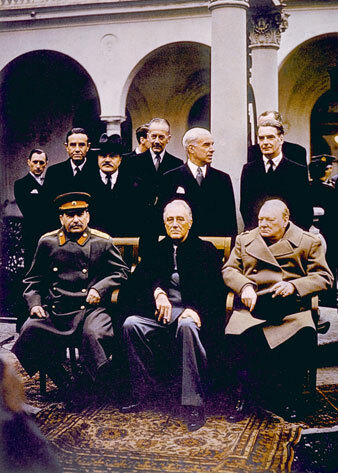 Everett Collection The Yalta Conference, (seated) Joseph Stalin, Franklin D. Roosevelt, Winston Churchill, February, 1945. The first reactions of the capital to the concrete and energetic communiqué from the Crimea Conference indicates that this will rank as one of the President’s greatest achievements. With Mr. Churchill and Marshal Stalin, he has taken us one firm step farther along the difficult road to a total victory and a stable peace. Much since November 7 has been disheartening to the day-by-day observer, but in the proceedings at Yalta the historic significance of Mr. Roosevelt’s reelection is made plain — in foreign policy a continuation of close and friendly liaison among the leaders of the Big Three, the sine qua non of Axis defeat and post-war reconstruction. One can easily imagine Governor Dewey doing many of the same things and making many of the same appointments as Mr. Roosevelt since the election, but one cannot imagine a Republican President reaching the Crimea agreement on Poland, as one cannot imagine a Republican President appointing a man of Henry Wallace’s outlook as Secretary of Commerce. Whatever his compromises on less important matters and however his evaluation of detail and his sense of timing may differ from those of some of his progressive supporters, Mr. Roosevelt’s course clearly remains charted toward the two major objectives of an enduring peace abroad and full employment at home. This is what we voted for. In the sphere of military action the Crimea communiqué is regarded here as foreshadowing a new offensive against the Reich, this time from the north, probably through Denmark. Should the Germans be forced to fight on a fourth front, their collapse would be hastened, and there is much hopeful speculation about the Russian agreement to sit in with the Chinese at the United Nations Security Conference to be held at San Francisco on April 25. The date is the deadline for denunciation of the nonaggression pact between the U.S.S.R. and Japan, and it is felt that the Soviets would not risk this announcement, with all it may imply in Tokyo, unless they were confident that final victory over the Reich will be dose enough in the next few weeks to enable them to handle a surprise attack by Japan. This reflects confidence by the U.S.S.R. not only in its own strength but in the trustworthiness of its allies. A related indication of the ever closer relations among the Big Three is found in certain phrases in the communiqué which seem to doom any hopes that might have been nurtured by the “Free German” generals in Moscow. When Stalin joins in expressing an “inflexible purpose to destroy German militarism . . . to disarm and disband all German armed forces; break up for all time the German General Staff. . . remove or destroy all German military equipment; eliminate or control all German industry that could be used for military production … remove all Nazi and and militarist influences from public office and from the cultural and economic life of the German people” (my italics), he must feel sure enough of his Western allies to shut the door on the use of the Marshal von Paulus crowd as an alternative instrument of Soviet policy. A declaration of intent to “disband all German armed forces” is a departure from earlier Stalin statements that seemed to promise the Reich the right to retain an army and opened an avenue of negotiation between Moscow and dissident German generals among its prisoners. * To use some of these generals as pawns against the West might at one time have seemed a grim political possibility in Moscow. Apparently the Crimea Conference has made Marshal Stalin feel that no such dangerous game will be necessary. This is regarded here as not the least of the President’s achievements at Yalta. Even so fruitful a conference as the one just closed cannot be expected to solve all mutual problems. It is noted here that while the leaders of the Big Three agreed on the establishment of a joint commission to discuss reparations, they have yet to establish a joint commission on war crimes. The communiqué does, indeed, speak of an inflexible resolve to “bring all war criminals to just and swift punishment,” but recent events have made it quite clear that this resolve is much less inflexible in Washington and London than it is in Moscow. It may be significant in this connection that the communiqué makes no reference to the industrialist collaborators of the Nazis whom the Russians also wish to punish but some Anglo-American circles are anxious to protect. This may explain the failure to set up a joint body to handle the many complex problems involved in punishing Nazi higher-ups and the omission of any joint statement warning the neutrals not to grant asylum to Nazi leaders. In this sphere it would seem that leaders of the Big Three do not yet see eye to eye. Franco Spain is one of the neutrals which need renewed warning, and the Argentine is another. Here the differences among the powers are well known. It is good to know that there will be closer cooperation and consultation among the Big Three in the future in regard to liberated countries, and it is hoped that they will also decide in the near future to begin informal but detailed discussion of the problems which will arise in the occupation of Germany. The announcement that the Reich will be split into three and almost certainly — when the French join in — four separate spheres of military control does not solve these problems; it only sets the stage for them. There will be a joint military commission in Berlin, but this also will not be enough to make certain that the occupying powers carry out their pledge to extirpate all traces of Nazism in the Reich. The Russians are better qualified for this task by political training, temperament, and the working-class basis of their regime. Unless there is mutual discussion, we may find Nazi elements taking refuge underground in the more equable and complacent climate of the English or American tone of occupation. This would be dangerous not only for the future of the Reich but for future relations among the occupying powers. It is in the handling of these concrete problems that Allied unity and efficiency will be tested rather than in the formal details of voting rights and the structural charts for the projected world security organization. But it is on the latter and above all on the Polish settlement that discussion in Congress and by the opposition will center. The position to be taken by the Republican Party is not to be judged from the first approving statements evoked by the Crimea communiqué. Senators Austin of Vermont and White of Maine have applauded the results of the conference, but both are internationalist Republicans. Herbert Hoover, with unexpected and admirable magnanimity, has praised the President’s work. But Vandenberg, the bell-wether of the party majority on foreign policy, indicated that he was undecided about the Polish settlement. It is on the Curzon line that the main battle will be fought. The danger is not from the extreme isolationists like Wheeler; they command the sympathies of only a negligible minority in the country and the Senate. The danger, as in the old League fight, lies in those who express themselves as fully in accord with the need for preventing German resurgence and establishing world peace but –. This time the leader of the “but” brigade is Vandenberg. Until the announced results of the Crimea Conference, he seemed to offer a bridge, however shaky, between the old isolationism and world cooperation. But the final settlement of the Polish question at Yalta brings fully into view the most treacherous aspects of the Vandenberg proposal. Now to propose the reopening of the Polish settlement after the war would be to disrupt the Allied unity and confidence on which not only the military strategy but the diplomatic decisions of the Crimea Conference were based. Not the slightest cost of the Vandenberg proposal would be Soviet cooperation in the war against Japan. To insist on perfectionism along the Pripet Marshes might mean payment in American lives on Pacific islands. That would be a high price to pay for Polish megalomania and American domestic politics.